This week's mani was inspired by the random way my polish was arranged on my coffee table. By chance, a bright green, blue, purple, yellow, and pink just happened to be clustered together and I was all: HEY, THAT LOOKS LIKE POP ART! 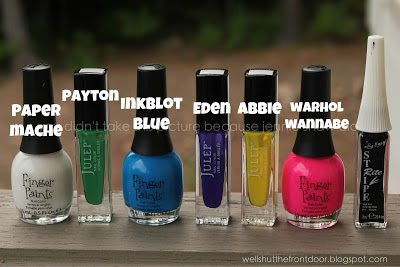 I SHOULD DO A POP ART MANI! YAY! Hahahahahaha! Yes, I really did say that out loud and followed it up with a giggle. So, I got out my dotting tools and got to work. Step 1: Two coats of Paper Mache. Step 2: Get the Black Stripe Rite and write something in the middle of your feature nails. Do two coats of black (and try not to have a lot of caffeine the day you try to do this because shaky fingers will result in the "Pop" problem of stray lines on my right hand, just sayin'). Then, do a zig-zag pattern around the words. Step 3: Take out the colours you'd like to use and, using a small dotting tool, pick one of the bright colours and get to work filling in the space around the zig-zag. 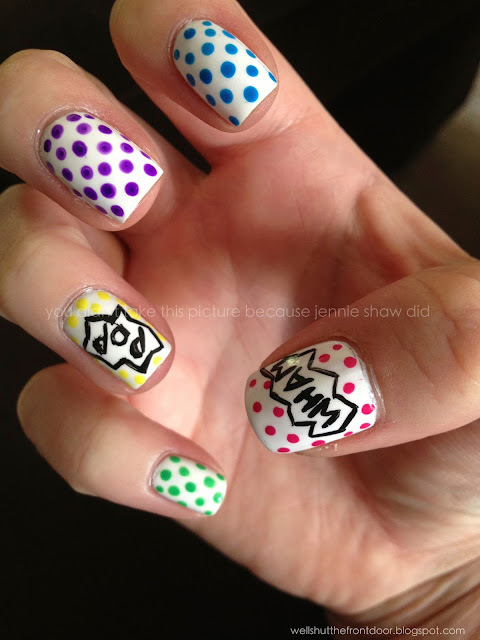 Step 4: Fill in the rest of your nails with differently coloured dots and -- BAM -- you've got a killer pop art mani. The hardest part of this mani was definitely writing the words. I'd say that if you have a pal who's inclined to help, it may work better to have someone do it for you (especially as writing with your "other" hand is super challenging not to mess up). 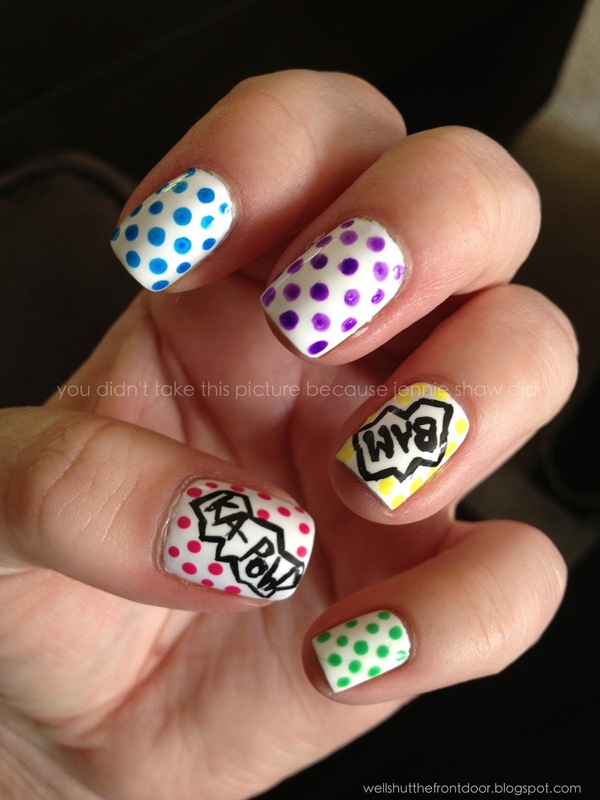 Aside from that, though, as long as you can do dots, this mani doesn't take very long. Plus, it's SUPER FUN, GUYS, which means that you should totally do it. Doooooo it. Haha!! Love this idea!! So cute! So creative and I love the way these came out! !